MicroSD Cards are the newest and smallest flash memory secure digital cards available, much smaller than both standard SD memory cards and even MiniSD memory cards. MicroSD cards created to be used with mobile phones; however other applications such as GPS receivers, digital cameras and Mp3 players do exist. The MicroSD Card is extremely small, only about one-fourth of the size of a standard SD memory card. It can be considered the size of a human fingernail. 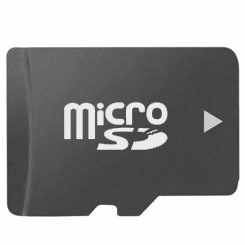 The MicroSD Card is currently the smallest compact flash memory card on the market commercially. It was originally developed as the T-Flash (sometimes called TransFlash). It was announced in March of 2005 and was made available commercially a year later in 2006. The storage capacity for MicroSD cards can range from 128 MB to 6 GB; however, they most often contain storage sizes from 1 GB to 2 GB. Storage capacity should increase in future products. One of the great advantages of the MicroSD Cards is that they are backward compatible with many electronic devices that use standard SD memory cards. You can find many uses for standard SD memory cards including digital cameras, MP3 players and PDA's (personal digital assistants). Using the adapter (usually included with the purchase of the card) the MicroSD Card can easily and quickly be inserted in any device that is compatible with SD memory cards. You can easily swap the cards between devices or have it read by your personal computer.